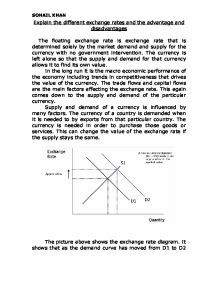 Explain the different exchange rates and the advantage and disadvantages The floating exchange rate is exchange rate that is determined solely by the market demand and supply for the currency with no government intervention. The currency is left alone so that the supply and demand for that currency allows it to find its own value. In the long run it is the macro economic performance of the economy including trends in competitiveness that drives the value of the currency. 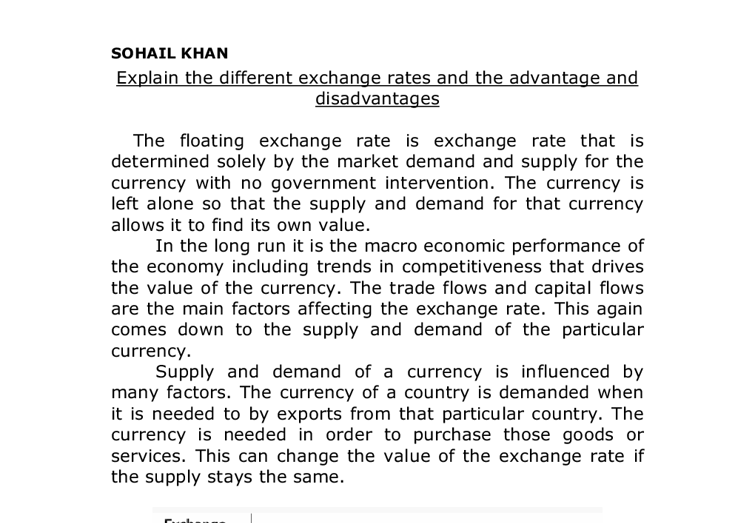 The trade flows and capital flows are the main factors affecting the exchange rate. This again comes down to the supply and demand of the particular currency. Supply and demand of a currency is influenced by many factors. The currency of a country is demanded when it is needed to by exports from that particular country. The currency is needed in order to purchase those goods or services. This can change the value of the exchange rate if the supply stays the same. The picture above shows the exchange rate diagram. It shows that as the demand curve has moved from D1 to D2 the exchange rate there has been an appreciation in the exchange rate value. The reason for this is that as there is a short supply of currency, the demand has increased causing the exchange rate to appreciate. ...read more. Countries such as Italy and the United Kingdom have seen this as an effective way to break inflationary expectations in the labour market, in part by the implied reduction in the discretion of national policymakers. Low-inflation countries such as Germany, however, are concerned about whether the ECB would continue to follow the conservative monetary policies of their national central banks. The single European currency�s ease of trade would allow the easy establishment of Trans National Corporations (TNC�s), which in turn would create more jobs for more people on a greater geographical scale. This would mean that benefits would be lowered, as not as many people need to claim them. The money saved from benefits would mean that more money is available for public spending, so public services, such as the NHS would be able to offer more quality services. The above arguments seem to convey a very positive view of the single European currency. But on the other hand, there are many reasons why people believe we should not participate. Firstly, looking at the moral aspects of the argument, the loss of our own currency would be a loss of our heritage, our independence, and our freedom. Many people do not want to see the face of the Queen banished from the head of our coins to be replaced by something unfamiliar and European. ...read more. There are alternatives: USA and the commonwealth can provide many more goods and services than Europe. A single monetary policy cannot deal with the differences, divergences and cyclical variations in the European economies. National currencies provide an adjustment mechanism, and allow governments to use interest rates to respond to events. A single European currency would remove these options. Instead, a single European interest rate, set by the European Central Bank in Frankfurt, would apply indiscriminately to the whole single currency area. This creates the problem of how a participating country could adjust to a shock or economic development specific to that country. Simply taking a look in the media, it is true to say that the Euro has met its first hurdles. It is failing in many aspects including being very weak against the pound. So would the people of Britain be wise to join a system which is already, within its first year of real operation, facing flaws? I am sure the answer is no. There is great variation in the economic cycles of the European countries involved in the single currency. The unification of these nations under the banner of a crisp Euro note would be confusing for many countries and it would be a long and arduous process until they were all similar. This process would most probably involve high prices, high taxes and increased unemployment for a great deal of time until these problems are rectified. SOHAIL KHAN ...read more. However, the U.S. enforced its role through the established institutions by adjusting them into the new conditions. Assuming the leadership of the Western world in the Cold War period, U.S. pursued the policy of transforming its hegemonic architecture, by making the redefinitions of the new security dimensions of Europe mostly through NATO. international currency such as the United States dollar; and � faster economic growth within the European Union will lead to a larger economy and therefore a more widely used currency. Will the euro become a more important currency than the United States dollar? The majority of necessary minerals, such as iron ore, copper, and coal were contained in the North as well, fueling the factories of the Union. The sheer number of resources and number of troops in comparison to the South should have been an indication that the North should win. legal problem in cyber space, emerald p 41). "In order to ensure compliance it is good practice to require customers to click acceptance of terms and conditions before processing". If it is a contract over a website, the buyer shall click on an icon to confirm that they have read the terms and conditions. its members export more than $680bn, and have an additional Rule for joining the single currency. Twelve of the 15 EU countries have joined monetary union, if the remaining three want to adopt the single currency at a later stage. political games and the questioning of the power within, and of, the EU. During the campaigns FPO's main point was their fear of foreigners in Austrian society ( also see paragraph ?.?.). The SPO as a result stressed their opposition against Haider and his party.